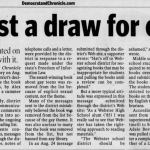 May 20, 2007) — WEBSTER — A controversial book removed from a summer reading list for high school students in the Webster Central School District last year is back on the list. 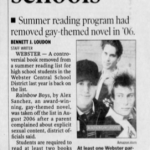 Rainbow Boys, by Alex Sanchez, an award-winning, gay-themed novel, was taken off the list in August 2006 after a parent complained about explicit sexual content, district officials said. 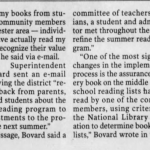 Students are required to read at least two books over the summer and write reports due at the start of the next school year. 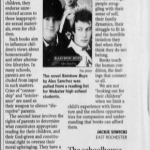 Students can read books not on the list if they get permission. 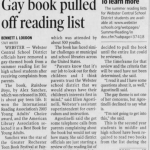 Critics of the removal contend the gay story line was a factor in the decision, but district officials said the book was temporarily removed while they reviewed the process used to select books for the list. 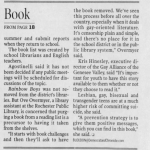 Ove Overmyer, a library assistant at the Rochester Public Library, said he expected that the book would be returned to the list. 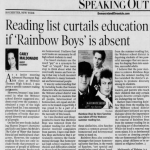 “Those lists should be lists of inclusion, nothing should be excluded. That’s a good thing. 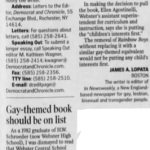 I think we learned something from the whole process,” he said. 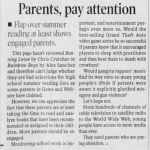 “Parents should be responsible for what their children read, but other parents shouldn’t tell other parents what their kids should read,” Overmyer said.